I have mentioned it before, perhaps too often for some of you who may have been stuck in a snowdrift of late, but the weather so far this winter has been crazy good. I haven’t had much time for photography lately, so when I had a free afternoon last weekend I decided to take advantage of the near perfect December day. This is a bit of what I saw, heard and smelled during the three hours or so I was out. I left my home in the upscale Gu Bu shopping area and battled the traffic across Fei ‘e Road. I entered the small riverside park that is split by the south side of The Liu Jiang Bridge. Avoiding the shoe shine gals, I steered wide of the stinky tofu carts and sugar cane sellers and bounded up the three steps to cross the bridge. 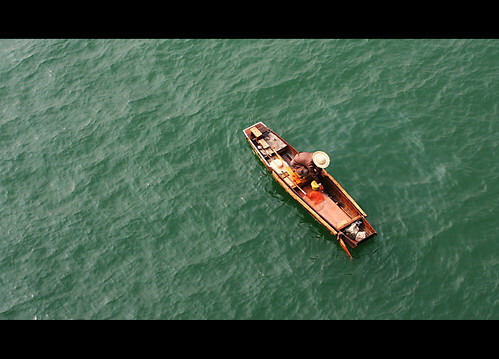 The Liu Jiang (river) is running slow and lazy these days. It is cleaner than at any time since my arrival more than 16 months ago, a beautiful jade ribbon flowing like a serpentine dragon though the city. I spotted this lone fisherman, bobbing along on the current just before he disappeared under the bridge. At the north end of the bridge lies the city center. I crossed Long Chen Road, dodging the buses and taxis, motorcycles and scooters, and took a back street east parallel with the river. 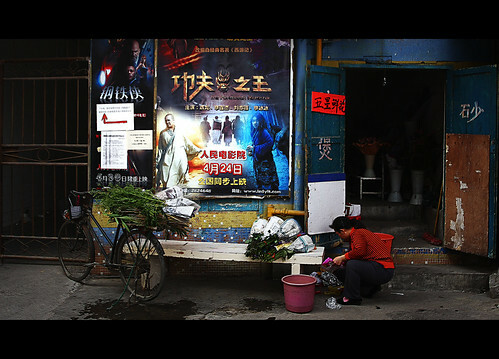 I came across this woman cutting flowers in her shop behind the cinema. This small area, the backside of about two city blocks, is scheduled to be demolished to make way for yet another non-descript steel and glass hi-rise. I continued on east, past the pirate DVD shops and then took a left at Wen Hui Bridge, walking north toward Liuhou Park. A few blocks later a Muslim restaurateur had his grill going on the sidewalk. 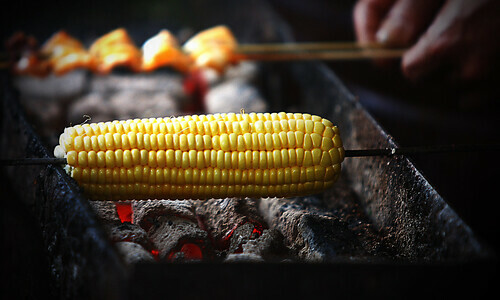 The grilled lamb, sprinkled generously with cumin and the corn on the cob looked and smelled great. Too bad I had just eaten an hour before! A few more blocks past Liuhou Park and I made a turn back to the north, past the Museum and Peoples Square. 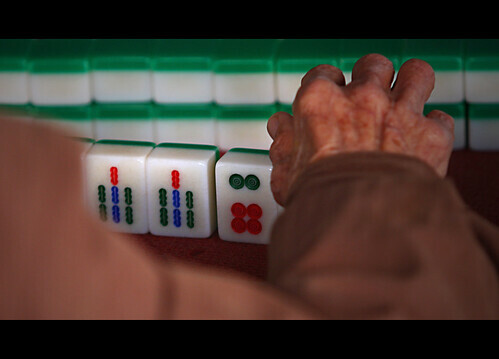 All along the way, I saw groups of men playing cards and mah jong. 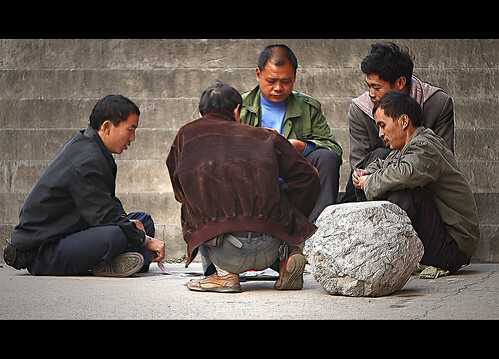 It’s a common site across China, men whiling away their day with a game of chance, putting their meager salaries at risk. Another left and I was headed south back toward home through the square. I zigzagged through some alleys and back streets before ending up back on the Number One Bridge. About half way across I saw the familiar figure of this homeless old blind man. He sits here about halfway across the bridge, almost every day. He sings a woeful nasal tune that is really quite horrific. 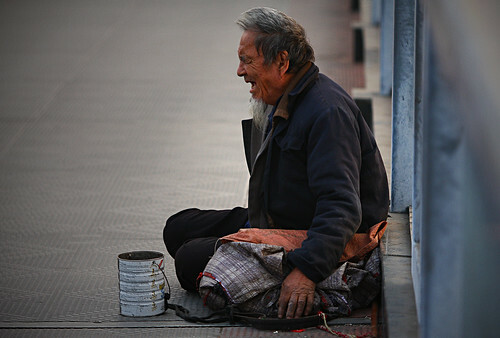 I have seen him often and sometimes give him some cash, but until today I had never taken a photo. I tried to talk to the old guy but he never acknowledged me, just kept on wailing. I took a few shots, and as is often the case a small crowd began to gather. I decided to move on rather than try to explain to folks what I was doing. That is a metal sidewalk he’s sitting on, hard and cold. Back at the south end of the bridge I headed back into the riverside park. The park is always full of retirees enjoying each others company. Lately, the park is also full of these pink flowers. The majority of the trees are covered with the blooms, which is one of the (many) reasons it doesn’t feel much like Christmas. If anybody knows what kind of trees these are please let me know. After coming out on the other side of the park, I again crossed the Fie ‘e Road into my neighborhood and after a few more minutes I was in the elevator headed up to the house. That’s all for now, I hope you enjoyed the tour. I’ll try and write some more over the weekend, after that I’m not sure when I’ll find any more time until the semester is finished. ~ by Expatriate Games on December 19, 2008. Sounds like an interesting place, with a bit of everything. Great pictures! The Liu Jiang reminds me of Li Jiang in Guilin. Great job, Michael — a very effective combination of words and pictures. When you mentioned the stinky tofu, I was glad you couldn’t attach aromas! Such idealic and romantic photos! It really doesn’t look like Christmas there does it? But then, neither does where I am either! I love stinky tofu! Great beer food. THAT, might be the only possible way I could eat the stuff, IF I drank enough beer first!